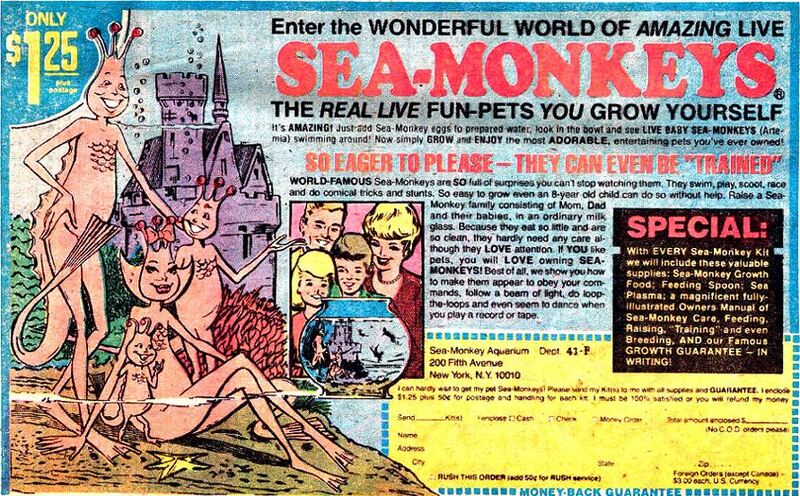 Karen C. asks: What exactly were sea monkey creatures and how did they survive in their packaging for so long? The product of a collaboration between a marketer and inventor and a marine biologist, Sea-Monkeys are a hybrid of several species of brine shrimp (Artemia), bred to have a particularly long dormant period, as well as to foster a large swarm. Brine shrimp have existed in much the same state for many millions of years. Found across the globe in saltwater lakes (but not oceans), they prefer habitats of high salinity in order to protect them from predators. As saltwater lakes tend to dry up from time-to-time, brine shrimp have adapted a technique of going into a kind of hibernation, called anhydrobiosis, where the creature’s metabolic processes stop once it becomes desiccated. When female brine shrimp produce eggs (viable specimens of which can be produced asexually or sexually), if unfavorable conditions are present, the eggs are produced with a special coating and remain in a form of stasis until conditions are right for hatching. Remarkably, when the eggs are in this metabolically inactive state, in certain conditions the eggs can survive temperatures as low as just 83°C above absolute zero and temperatures slightly above the boiling point of water at sea level. This brings us to 1957 and a man named Harold von Braunhut, who throughout his lifetime invented such famous novelty items as X-ray glasses, Crazy Crabs, and Invisible Goldfish (guaranteed to never appear in the fish bowl that came with the kit- incidentally, never, ever put goldfish in a little fish bowl). After witnessing the success of the ant farms marketed by Milton Levine, von Braunhut came up with the idea for selling brine shrimp in a similar pet kit, which he initially marketed as Instant Life. Not alone, at about this same time Wham-O floated a comparable product using African killifish, which they called Instant Fish. These particular creatures lay their eggs in the mud of rivers and lakes. If the lake or river then dries out, the eggs are able to survive and stay dormant until the following rainy season when the water is restored. For their product, Wham-O simply sold packets of mud that contained some of these eggs. However, due to their inability to produce a sufficient number of the eggs to make the product commercially viable, combined with issues with quality control (many of the eggs never hatched), they ended up having to stop producing the novelty pet item. To get around such issues on his own product, von Braunhut enlisted the aid of one Dr. Anthony D’Agostino, a marine biologist, to produce a resilient, hybrid shrimp that could withstand the rigors of the 20th century mail order marketplace. Working at Montauk’s New York Ocean Science Laboratory, they eventually named their hybrid Artemia NYOS. More than just fiddling with the brine shrimp, von Braunhut and D’Agostino also developed a two-step system to ensure the best possible habitat for the creatures once they arrived at the customer’s doorstep. First, a packet of “Water Purifier” containing salt, water conditioner and brine shrimp eggs was to be added to tap water. The inclusion of the eggs in the so-called “Water Purifier” was so that the illusion of “instant life” could be kept. After emptying this first packet into the water, the instructions indicated to wait 24 hours before adding the second packet, labeled “Instant Life Eggs”. To maintain the brine shrimp, every few days a little more food was added from a packet labeled “Growth Food,” consisting of more yeast and spirulina. If one was lazy and simply didn’t clean the container, the brine shrimp could also happily feed off the algae growing in their home. 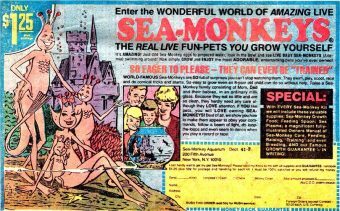 Aggressively marketing his Sea-Monkeys throughout the 1960s and 1970s, von Braunhut once claimed that he was purchasing more than three million pages of comic book and magazine advertising per year at one point. We’ll leave it to you to decide if you want to believe him on that one. Demonstrating von Braunhut’s mastery of seeming to say things in his ads that he never technically said, the judge who heard the case ultimately threw it out, reasoning that no one gets bent out of shape with the sale of sponge cake, which isn’t a sponge, or the fact that butterflies aren’t made of a dairy product. Still selling remarkably well today, a recent court case over disputed royalties for the product revealed that, in 2006, Sea-Monkey sales were still grossing nearly $4 million per year. How Did the Pet Rock Fad Start? Harold von Braunhut’s died in 2003 at the age of 77 after an accidental fall. His widow, former star of such films as Venus in Furs, All Women are Bad, Death of a Nymphette, and Too Much Too Often, Yolanda Signorelli von Braunhut, has recently been embroiled in litigation with a toy company, Big Time Toys, that bought certain rights to the Sea-Monkey brand about a decade ago, but, according to her court filings, has failed to completely pay for them. No small sum, royalty payments to her are supposed to be 20% of the gross sales or about three quarters of a million dollars per year, based on the 2006 sale numbers. Instead, Big Time Toys has simply stopped paying her anything. More than just a novelty, brine shrimp are widely used in aquaculture as an easy-to-store and cost-effective fish food. More than 2,000 tonnes of Artemia cysts (the dry form) are sold each year globally. They are not Krill, they are a hybrid of brine shrimp as stated in the article. Krill are similar but different. I’m still waiting on my cardboard submarine…. I got mine. It was a disappoint even by the standards of comic advertisement….